A writer takes in a mysterious drifter at his remote cabin and soon finds himself in a dangerous situation spiraling out of control. 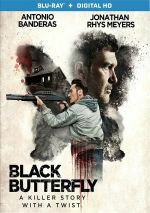 Based on 2008 French TV movie, 2017’s Black Butterfly offers a thriller. A writer by trade, Paul Lopez (Antonio Banderas) finds himself on hard times and beset by writer’s block. Desperate to reignite his career, Paul isolates himself in a remote Colorado cabin. When he visits the nearest town, he encounters a drifter named Jack (Jonathan Rhys Meyers). After the loner helps the writer avoid a bar brawl, Paul decides to offer Jack a place to stay, a decision that proves fateful. Jack becomes demanding and pushy, factors that lead to potentially violent clashes between the two men. Hmm… a story about a successful writer who works in an isolated location and who must deal with a psychotic who horns in on his work… Why does that sound so familiar to me? Because I saw Misery, that’s why. Without question, Butterfly clearly tips its hat toward the 1990 hit – right down to the fact both efforts name their lead roles “Paul”. Despite these obvious similarities, Butterfly feels more like an homage to Misery than a rip-off, partly because the characters themselves differ so much. Other than their names and careers, the two Pauls lack much to connect them, and other than their apparent mental illness, Jack and Misery’s Annie fail to seem linked. This means Butterfly gets the chance to develop its own identity other than as a Misery knockoff. While Butterfly doesn’t work as well as the 1990 film, it still manages to turn into a fairly enjoyable thriller. Some of this comes from the way its plot develops, particularly in terms of character movement. For much of Butterfly, Paul comes across as the more mentally unstable of the two lead men, whereas Jack seems introspective and calm. For a while, Butterfly Looks like it’ll be an inspirational tale, as we can see how Paul’s providential encounter with Jack will spark his creative juices and bring him back to prominence. Eventually matters turn, of course, but I still like the ways in which the film teases with the characters’ personalities. Once Jack goes into nutbag mode, matters seem to follow a more predictable route, but even then, the movie manages a mix of twists and turns. Just when it starts to feel pat, it veers in a different direction and gives us some clever shifts. All of these allow Butterfly to present a better than average thriller. It offers just enough cleverness and intrigue to make it an enticing affair. Black Butterfly appears in an aspect ratio of approximately 2.39:1 on this Blu-ray Disc. This was a largely positive presentation. Sharpness was almost always strong, as only a sliver of softness ever crept into the presentation. Still, most of the movie showed appropriate delineation. Like most modern action flicks, this one opted for stylized hues, so teal and amber dominated. Within those constraints, the colors seemed fine, as they showed appropriate range. Blacks were dark and full, and shadows came across with reasonable clarity. All this added up to a mostly good image. The DTS-HD MA 5.1 soundtrack of Butterfly worked well. Various action elements offered the most active use of the spectrum. These scenes didn’t emerge on a frequent basis, but when they appeared, they utilized the soundscape in an engrossing manner, and music made active use of the different channels. Audio quality pleased. Speech was concise and natural, without edginess or other issues. Music showed good range and vivacity, while effects worked nicely. Those elements came across as accurate and full, with solid low-end response and positive definition. This left us with a “B” soundtrack. In terms of extras, we find an audio commentary from director Brian Goodman and co-writer Marc Frydman. Both sit together for this running, screen-specific look at the source and its adaptation, cast and performances, sets and locations, story/characters, music, and related elements. Though not totally devoid of useful content, the commentary lacks much merit. We get a fair amount of dead air, and even when we hear remarks, the material tends to be bland and forgettable. This becomes a sub-mediocre track. Backstage runs nine minutes, 11 seconds and offers info from Goodman, director of photography Jose David Montero, VFX supervisor Peter Nalli, and actors Antonio Banderas, Jonathan Rhys Meyers, and Piper Perabo. They discuss story/characters, Goodman’s impact on the production, cinematography and effects. Expect a few nuggets of information along with a lot of fluff in this largely superficial piece. The disc opens with ads for Aftermath, Extortion, Isolation, Arsenal and Solace. We also get the trailer for Butterfly. Despite superficial similarities with Misery, Black Butterfly forges its own identity. The film gives us a fairly clever tale with enough twists and curves to keep us involved. The Blu-ray provides pretty positive picture and audio along with less than informative supplements. I felt pleased with the tense thriller we get here.